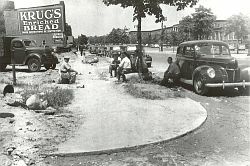 The first sepia toned image is from a 1947 newspaper article annoucing the construction of a new apartment building at 82nd Road and Queens Boulevard - the Hampton House Apartments. The black and white photograph shows workmen at the construction site taking a break. 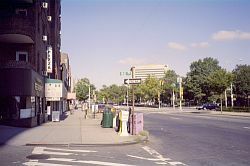 The view is looking west on Queens Boulevard from 82nd Road. The color photograph taken last year shows that same view today. On Sunday, Oct. 9th, members of the class of 1954 from PS 99 are meeting for a mini reunion. We will be meeting at the school at about 10:30 and then touring the area. We will be stopping for lunch. If you would like to join us please contact me so that we will know approximate numbers. Please bring a picture of yourself from the 1950s. Robert Lieberman will be filming the reunion in conjunction with a film he is making on the refugee families who lived in Kew Gardens at that time and would like to use the pictures in his film. SUNDAY, OCT .9, 2005 bring your camera. We will be meeting by the 114th Street entrance at 10:15 am.The custodian, John Beard, has been kind enough to open the school on his day off, so please be prompt. This will be on your own ,and will be immediately following the visitation through the school.Recall the fun you had "way back when",ordering The Kitchen Sink. Editor's Note: Thanks to Helga (Marcus) Stein for this photograph of the 1947 Temple Isaiah Confirmation Class..
Editor's Note: Thanks to Peter Schiftan for this old advertisement for a photography shop that used to be at 81-61 Lefferts Boulevard.. Anyone who grew up in K.G.or vicinity interested in visiting places like Overlook Park,Dani's Pizza, etc.in the old stomping ground", on Oct. 8,2005 at 12pm ? (Let's do an informal lunch somewhere in the neighborhood too.) Several former K.G. residents will be coming from all parts of the country to attend The '65 R.H.H.S . 'Reunion that evening at 8pm.It will be held at The La Guardia Marriot Hotel. The following day, Oct. 9,2005, activities for the' 65 graduates will include a tour of the school ,(10:30am),and an informal lunch at The Original Jahn's. If anyone wants to participate in meeting on Saturday afternoon, please post here.If a good number of people want to meet ,perhaps someone out there will want to organize the group.Nothing is definite for the "gathering"yet,however, it is not too late to express your interest in getting together that afternoon. Hi..my name is Helga Marcus Stein. I lived at 119-20 Union Turnpike in the early 40s when we came to America. I lived at 82-67 Austin St.(The Mowbray) from about 1945 until 1954, when I got married. My husband and I then lived at 83-80 118St until 1959. Click on thumbnails to view page. Editor's Note: Kew Gardens alumnus and independent film maker, Robert H. Lieberman, is going to do an independent documentary film about what it was like growing up in Kew Gardens during the 1940's and 50's. Filming will begin in Kew Gardens on October 9, 2005. Thanks for the postings of the newest photographs from the extensive Rogers collection. Didn't know you were such a good photographer and collector. GLad to see the picture of Explorer Troop 15. Scouting in KG was a great way to stay out of trouble. It gave me a great deal of self confidence and skills I still use today. Glad to see the pictures of Hank Diers. I was trying to find him recently and was saddened to hear of his death. Hank and I spent many afternoons and evenings in the marshes at the Eastern end of Flushing Meadows . At that time it was pretty wild and full of small game-rabbits,pheasant,etc. We tried hunting with bows and arrows (never got anything) and generally made it our private playground. Would like to thank Jay Rogers for posting those photos of my best buddy for 48 years, Hank Diers. I've missed him greatly since his untimely passing a few years ago. Hi Joe, just to let you know---we're doing a poetry and music show at the Theater Cafe on Thursday, Sep.22nd at 8 P.M. We have enough performers at this time. We're hoping for a nice sized audience. This is a particularly nice venue for this type of show. The Theater Cafe is located at 106-03 Metropolitan Ave. next door to the Cinemart Theater. Click on thumbnail to view photograph. Actors will be dressed in period costumes and stand near the graves of notable persons from the cemetery s historical monumental section. The characters portrayed will be the likes of Don Marquis, the illustrious author, The Bluebird of Mulberry Bend, a bad girl who found the loving hand of God, Elsie Dewolfe, illustrious actress and author, Mr. George W. Johnson, the first African American to record a song, plus many other historical figures that reach back 100 years ago. There will be stories of musicians, magicians, artists, and local residents that will come alive by the reenactment of the actors. A guide will take you through the cemetery.The stories are both interesting and touching. Editor's Note: I've just been told today that the house on Audley Street next to the water tower - the one that used to be the old Richmond Hill Golf Club House - is being torn down. The Who were King Where? 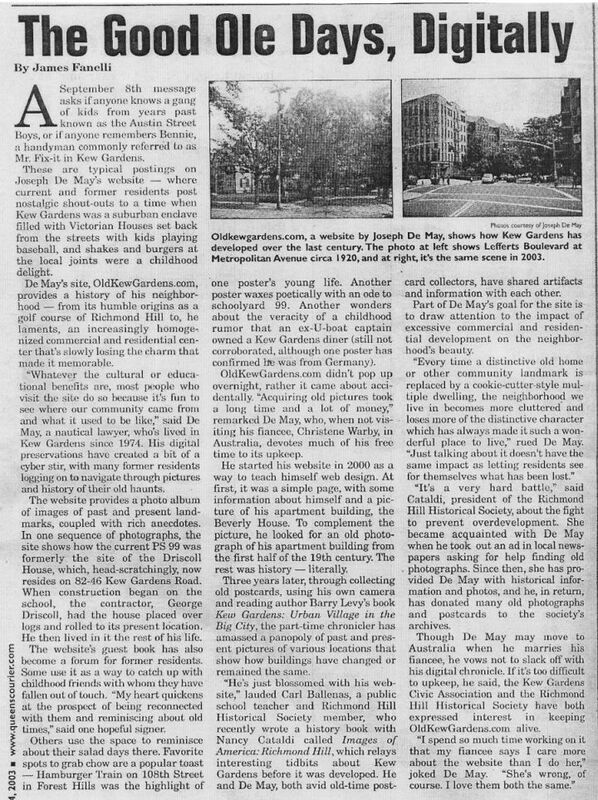 I know this is only borderline Kew Gardens at best, but during our junior high years, my friends and I would often walk home from Russell Sage along Austin Street and use the tunnel under Union Tpke. Amongst all the graffiti littering the walls of the tunnel (not to mention the unspeakable substances on the floors) one piece of writing on the wall always stood out for me: near the ceiling, in black spray paint, someone proclaimed "Suicide Savages are King in Rich-Haven". If memory serves, at one point the walls of the tunnel got whitewashed but the message reappeared soon after. Well, I think it took me longer than I'd like to admit to deduce that Rich-Haven was Richmond Hill/Woodhaven, but I'm still in the dark as to the story behind this infamous reign of terror. Street gang? Motorcycle club? Heavy metal band? Berserker warriors from a Dungeons & Dragons game gone awry? Anyone know anything about these guys? Did any of the Suicide Savages stay alive and become civilized? I want to thank you for this web site. My name is Harry Kaufman, and I grew up at 84-58 Abingdon Road. My family moved away in September 1966, and to my everlasting sorrow, the beautful house was torn down to build three ugly boxes. Not one photo exists in my family albums of my house, and for 39 years I have been hoping to see that house again. Tonight, thanks to this site, I have. Seeing my house again, the one in the middle, is among the happiest moments of my life. My mother, Gisele, now 88 felt the same way tonight. Editor's Note: Here are two off topic slideshows. First is my look back at the World Trade Center in honor of September 11th. Click here. The second is an almost 200 page slideshow on another web site showing what it was like in New Orleans during and after Hurricane Katrina. It's very well done. Close out the window to return here. Click here. Click on thumbnails to view photograph. During the spring of 1947 long piles were being driven by a huge steam pile driver to support the foundation of the Hampton House. The underground spring that had fed the old Muller's Goldfish pond evidentally kept the soil too fluid to directly support the foundation. In the school we could feel, as well hear, every blow, every part of the cycle, day after day, week after week. The teachers must have talked, and we listened, between the hammer blows. The driver wasn't on wheels or treads. It rested on and moved, somehow, over a complex of criss crossed 12x12s and steel I beams. One day there was a loud new noise. The whole thing had gone and fallen over. I didn't see it happen, but I did come back with my camera. I am the chairperson, and want to notify former classmates that they may contact greatreunions.com, or me at lv2trvlny@aol to find out info.Tic purchased by Sept .9th for $79, and $89 after that date . Also, would like to have someone run another K.G. reunion for that afternoon. The one Nov .'03 was wonderful . Editor's Note: As of February 1st, Old Kew Gardens [.com] got a new email address with Gmail, which is the Google web based email service. You've probably heard that Gmail offers two gigabytes [2,000 MB] of free storage. It's free, but available by invitation only. Invitations are so sought after that they are being offered for sale on eBay. I have invitations I can distribute to friends. I'm not selling them, I'm giving them away. They are available on a first come first serve basis. Just send me an email telling me you'd like one. Update: Unless I know you, your request must come from a bona fide working ISP email address. To prevent abuse, email requests coming from free web based email services like Yahoo or Hotmail will not be honored. Update: I will remove this post when I run out of invitations. If you're reading this, then there are still invitations left to give out.